Great attitude = Great trek. 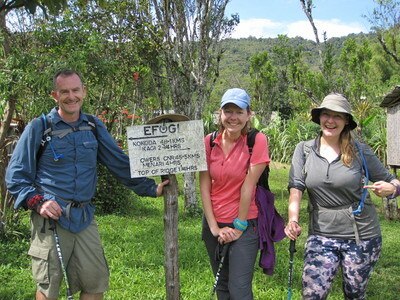 Wow what a trek, a small group, 1 family of 3 in fact and a very challenging trek, fortunately these were not just any trekkers they were very experienced trekkers and this would show over the 6 days of the trek. 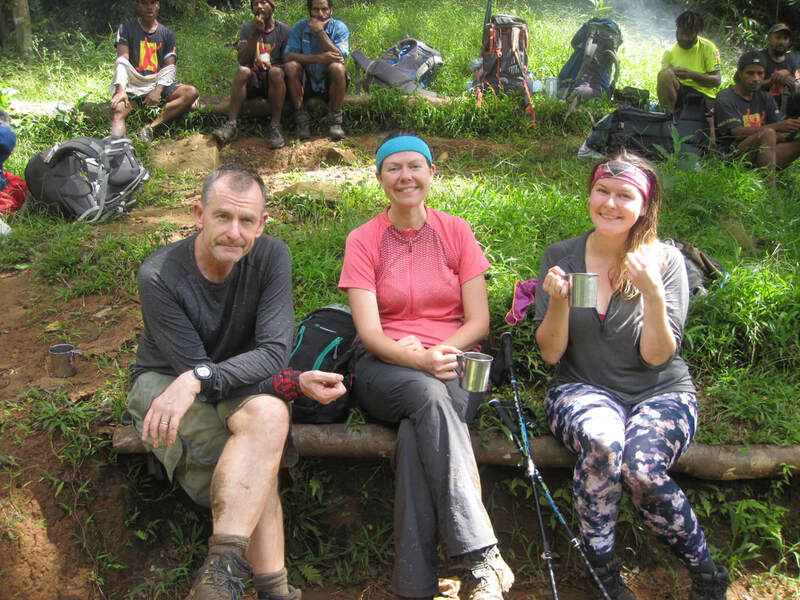 A 6 day trek is a challenge in itself but add to that one of the first groups through for the season, very wet conditions as the trek was on the cusp of the wet season and 6 days and it was not a trek for the faint hearted!. Day 1 was the usual early wake up and off to the airport before the sun had come up. A flight through cloudy conditions gave us an idea of the conditions ahead. The plane had to circle off the coast from Popendetta a for a while waiting for the fog to lift finally we touched down to be greeted by the always smiling Mary. 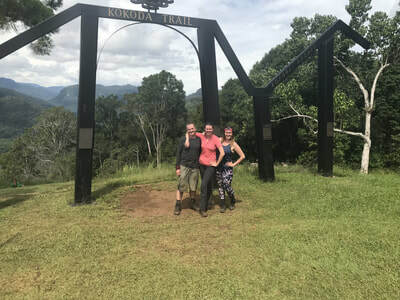 A bit of a look at and a few photos by the Bar fly and onto the PMV for a rather uneventful ride (although somewhat spacious with only 3 trekkers) then to Kokoda. 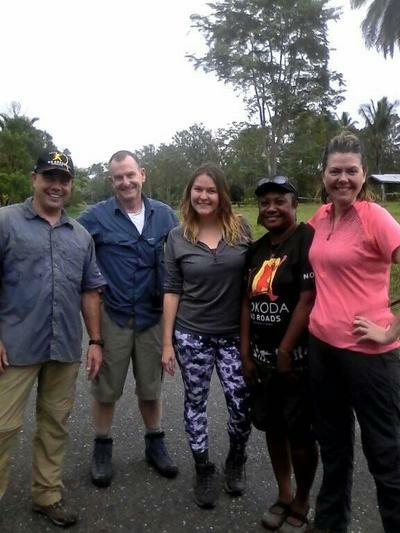 Lunch and History at Kokoda and a plan was hatched to possibly push on if we could make Deneki by 3. Despite a great effort by the trekkers and local crew we didn’t arrive at Deniki within our window to push on, ohh well a good chance to set up camp and get our routine squared away in a relaxed fashion as a few hard days would be ahead of us. Discussions that afternoon were around how mild the conditions were for our first day dry and not too hot. Perfect trekking conditions! 11pm that changed. Constant rain over night made what was already a challenging day even more interesting. Isurva for morning tea then Alola for a delicious lunch. For most groups Alola marks an end for day 2’s walking but not for this enthusiastic family it was time to push on over the hill to Eora Creek for a cold dip in the creek and to set up camp. Light rain was falling as we got into camp and the mud was heavy on our boots from the walk after lunch! The rain got heavier and continued all night, just what we needed for day 3, one of the 2 “MONSTERS”. The rain continued all the way to the top of Mt Bellamy, the walk from Eora creek through Templetons 1 and 2 to the top of Mt Bellamy is never easy but for this trek it was made even more challenging due to constant rain and energy sapping mud. The south side of Mt Bellamy bought us relief although by no stretch of the imagination was the track dry it was much better than what we had faced over the past 24 hours. The conditions were so good in fact the 2 girls decided it was time to sing movie soundtracks on our way down the Back of Bellamy. Lunch was at 1900 with the long slippery walk to Kokoda to finish off the first of our “monsters” The pizzas for dinner made it all worthwhile! 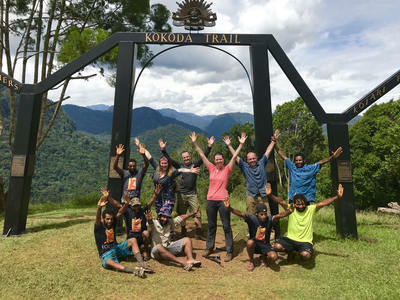 Day 4 was a comparatively short walk from Kagi to Menari conditions were dry and mild really good for walking Lunch at Brigade hill and before we knew it we were walking up the Menari air strip. Getting in relatively early was a good opportunity to recover and especially to work on feet that the wet conditions to date had not treated kindly! ​We woke up to rain as we got ready to set off on the true monster day of the Trek. The Maguli range for most groups is split over 2 days but for this keen family we were going to tackle it in one, as well as “The Wall”, the swamp and Ioribaiwa ridge, hearing those names listed made this a truly daunting day but a day the group took in their stride. The wet conditions had washed away the log crossing for brown river but within 15 mins our amazing crew had knocked up a rudimentary path of logs for us to safely cross the high and fast flowing brown river. The swamp was wet and the ooze under foot refused to let your boots go every time you took a step there was more water than mud at the base of the Maguli but we pushed through for lunch at new Nauro. From there the long haul over the Maguli was completed with only 1 stop, to let a beautiful 3m long python cross the track only meters in front of us. It was like waiting at a railway crossing as this beautiful yellow and black reptile of the jungle crossed the track in front of us. Totally oblivious or unconcerned about the group of trekkers it was holding up. The trek up Ioribaiwa was draining especially after all that we had crossed up until that point and then the walk down to camp was slippery and treacherous as the light faded we got into Ioribaiwa village just as a magnificent red sunset over the mountain ranges, a true sight to remember! We woke up enthusiastic looking forward to our final push out to Owers', we knew the end of our adventure was close, but a solid days trekking was still ahead of us. Water shoes were on for a morning spent in and out of Ua-ule Creek, where we come across one of the local hunters and his dogs carrying a morning's work! A solid climb over Imita and down to the Goldie and the end was in sight. One last effort up the sun baked hill to Owers' and cold beers with warm snags awaited this adventurous family! 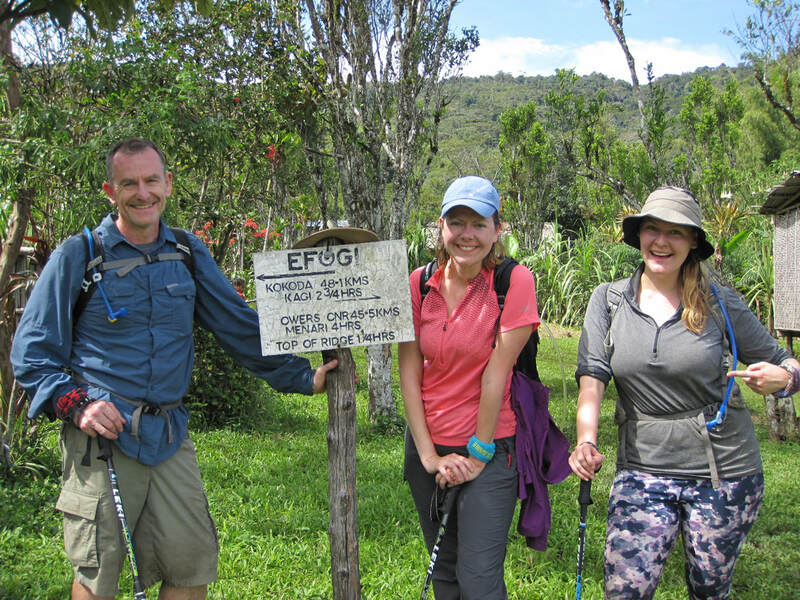 It was a difficult trek with challenging conditions but that was nothing to this keen positive family of trekkers!